Pulmonary mass lesion is a common radiological dilemma in day-to-day clinical practice. Most of these lesions are malignant and this possibility is further enhanced in the presence of compression and/or invasion of the adjoining structures. However, a benign lesion may occasionally present with such features and subsequently pose a diagnostic dilemma. Pulmonary actinomycosis (PA) is one such disease that may show up as an invasive mass lesion  and its infective nature may remain elusive. The histopathology of such a lesion may also be perplexing, even to an expert pathologist, as the clinical clue to its diagnosis is often missing and even the expert pathologist may miss the diagnosis for want of special staining. We are presenting such a case of PA for the benefit of the readers. 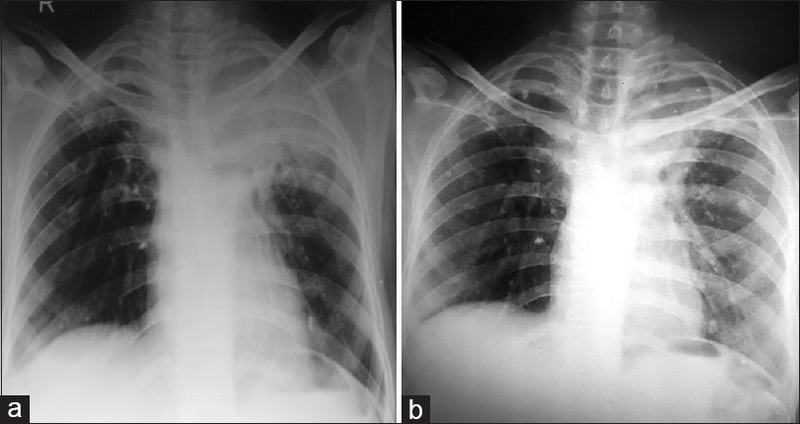 A 50-year-old housewife presented with intermittent cough and blood tinged sputum for 2 years, left-sided chest pain for 1 year, and low-grade fever for 2 months. She denied breathlessness, weight loss, and anorexia. She was a teetotaler and had normal bowel and bladder habits. She had received various antibiotics and symptomatics but it was all in vain. Ten years prior to the current illness, she had received antitubercular therapy for pulmonary tuberculosis with complete recovery. On general physical examination, she was of an average built and was well-nourished. She did not have any clubbing, pedal edema, peripheral lymphadenopathy, or cyanosis. Her respiratory system examination revealed a dull note and decreased breath sounds over the left upper chest. Added sounds were conspicuously absent. Nothing abnormal was detected on the examination of the other systems. Her chest skiagram posterior-anterior view, dated May 25, 2014, showed homogenous opacity in the left upper zone, along with scattered calcified lesions on both the sides [Figure 1]a. Blood counts and biochemistry (blood sugar test, renal function test, and liver function test) were within normal limits. Human immunodeficiency virus (HIV) serology was negative. Nothing abnormal was detected on ultrasonography of her abdomen. Electrocardiogram was also within normal limits. Her sputum was negative for acid-fast bacilli, fungus, or malignant cells. Contrast-enhanced chest tomography (CECT) of the thorax, dated May 27, 2014, showed a heterogeneously enhancing mass lesion, involving the apicoposterior segment and measuring 4.1 × 4.8 × 3.6 cm 3 . It was invading the left subclavian vessels and the third rib posteriorly with loss of subpleural fat planes but nothing abnormal was detected in the tracheobronchial tree [Figure 2]. 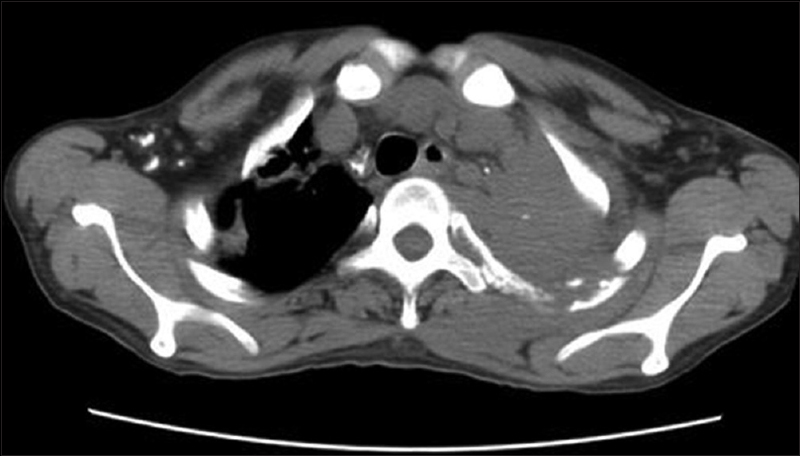 These computed tomography (CT) features were highly suggestive of a peripheral lung cancer. An ultrasound-guided trucut biopsy of the lung mass was undertaken. Hematoxylin and eosin (H and E) stained slides were negative for malignancy or tuberculosis but showed the tangled filamentous bacilli as dense hematoxyphilic mass lesions, surrounded by polymorphs and foamy histiocytes [Figure 3]. The filamentous hyphal masses were periodic acid-Schiff (PAS)-positive [Figure 3], inset]. The biopsy material could not be put to culture for want of clinical suspicion prior to biopsy. A tentative diagnosis of PA was made and the patient was put on intravenous (IV) penicillin (6 million units 8 hourly). On this, she improved and was discharged from the hospital after 2 months, on oral co-amoxiclav 625 mg in 8-h interval. Complete clinicoradiological recovery was seen in 4 months [Figure 1]b] and there is no evidence of recurrence in the last 6 months of follow-up. Clinical presentation of PA is mostly nonspecific that often makes its diagnosis difficult. In many cases, antitubercular medications have been administered without any improvement and surgical resections have been frequently performed due to a suspicion of lung cancer. It usually has an occult beginning but ultimately symptoms in the form of progressive weakness, low-grade fever, weight loss, cough with purulent sputum, breathlessness on exertion, hemoptysis, and/or pleural chest pain ensue. When hemoptysis is the presenting symptom, bronchiectasis, tuberculosis, lung abscess, aspergilloma, and bronchogenic carcinoma should all be considered in the differential diagnosis of the case. Systemic symptoms such as fever and weight loss are suggestive of an infective lesion rather than malignancy. Our patient had suffered from hemoptysis as well as fever but she denied any weight loss or anorexia. Physical signs in PA are equally nonspecific and include local tenderness, dull note, and decreased breath sounds. In the case of the infiltration of the chest wall, a local edematous and inflamed area may be seen that may later evolve into multiple discharging fistulae and osteolysis. Our case also had a localized area of dull note and decreased breath sounds but was devoid of any inflammatory lesion of the overlying skin. Radiologically, it usually presents as a peripheral, nonsegmental pneumonia. Kim et al. in a study of 94 patients reported that consolidation with central low attenuation was the most common radiological feature but that radiological features in PA were mostly nonspecific. Thus radiological lesions in PA may range from a few pulmonary infiltrates to a large cavitating mass lesion. The latter may be seen involving the pleura, pericardium, chest wall, mediastinal structures, or even the vertebral body. However, a noncavitary enhancing mass lesion, as was seen in our case, has not been reported in PA to the best of our knowledge. Fiberoptic bronchoscopy may reveal nonspecific endobronchial lesions and is usually nondiagnostic. Bronchoalveolar lavage may also be falsely negative if the material is exposed to air for more than 20 min but bronchial biopsy of an endobronchial lesion, if present, is of definite value as it provides material for pathological/microbiological diagnosis of the disease. Recently, Chawala et al. reported a case of PA with hemoptysis and an endobronchial growth mimicking lung cancer but biopsy of the same was diagnostic of PA.
All these histological features were demonstrable in the present case also except that the radially arranged sulfur granules were not seen. The absence of the latter could be explained on the basis of the nature of the lesion in our patient, that is, a noncavitary mass lesion in the lung without any superficial sinus tract or endobronchial extension. Thus, the organism, an anaerobe, was always exposed to a very low oxygen concentration. An anaerobic environment was, thus, favorable to growth and unfavorable to the formation of spores (sulfur granules in the case of PA) in it. We did not send the specimen for culture isolation of actinomycosis for want of clinical and/or radiological suspicion but the excellent clinical response to penicillin therapy for about 6 months was evidence enough to diagnose it as PA. The main principle of treatment is the use of high-dose IV penicillin for a long duration of treatment. Presumably, the avascularity and induration of infected areas account for the need for prolonged treatment and undoubtedly longer courses minimize the risk of relapses, a clinical hallmark of the infection. Although treatment has to be tailored to the individual, generally 18-24 million units of penicillin per day are given for 2-6 weeks followed by oral therapy with penicillin V (or amoxicillin) for 6-12 months. Chao et al. obtained excellent clinical response to antibiotic therapy in a majority of their patients for an average duration of 155 days. Although our patient presented with a noncavitary enhancing mass lesion, highly suggesting lung cancer, the presence of granuloma and absence of cancer cells in biopsy specimen, along with history of a chronic indolent disease led our pathologist to undertake special staining that unrevealed the true nature of the disease. Kim TS, Han J, Koh WJ, Choi JC, Chung MJ, Lee JH, et al. Thoracic actinomycosis: CT features with histopathologic correlation. AJR Am J Roentgenol 2006;186:225-31. Lionakis MS, Hamill RJ. Malaise, weight loss, pleuritic chest pain and productive cough: What is your call? CMAJ 2008;178:1289-91. Kim SR, Jung LY, Oh IJ, Kim YC, Shin KC, Lee MK, et al. Pulmonary actinomycosis during the first decade of 21 st century: Cases of 94 patients. BMC Infect Dis 2013;13:216. Mabeza GF, Macfarlane J. Pulmonary actinomycosis. Eur Respir J 2003;21:545-51. Chawla RK, Madan A, Chawla A, Chawla K. Hemoptysis secondary to actinomycosis: A rare presentation. Lung India 2014;31:168-71. 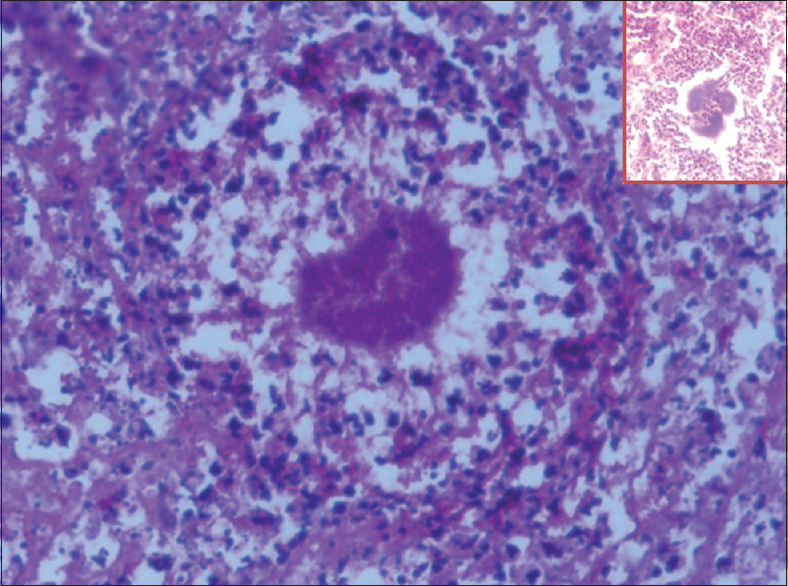 Brook I. Actinomycosis: Diagnosis and management. South Med J 2008;101:1019-23. Choi J, Koh WJ, Kim TS, Lee KS, Han J, Kim H, et al. Optimal duration of IV and oral antibiotics in the treatment of thoracic actinomycosis. Chest 2005;128:2211-7.